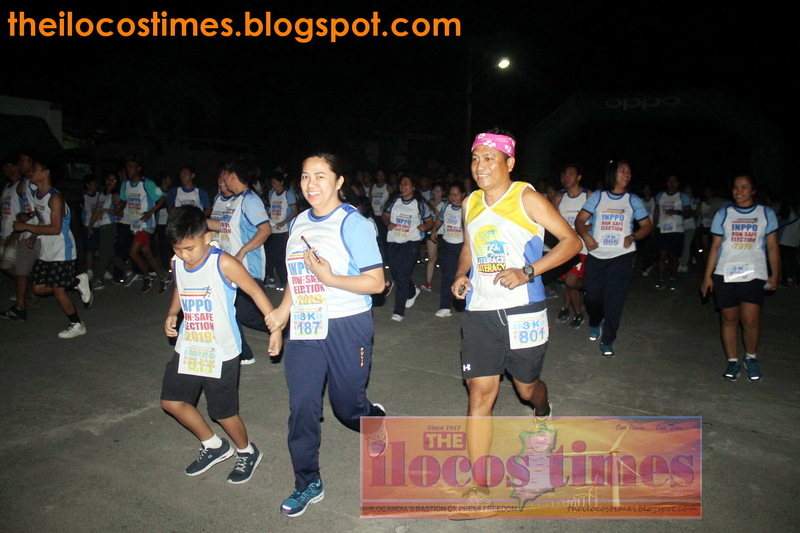 LAOAG CITY—Hundreds of runners from various parts of Ilocos Norte and nearby provinces joined the fun run on March 9, 2019 from Camp Valentin S. Juan in this city to the town of Vintar. Organized by the Ilocos Norte Police Provincial Office (INPPO), Police Maj. Angelito de Juan of the investigation division said the fun run aims to advocate peace in the upcoming May mid-term elections. “This is a friendly run with our allies and the candidates. We hope that we get rid of hurting and teasing each other during the campaign,” said Mr. De Juan during the opening program at the INPPO open ground. The event was among the activities of the INPPO and the Commission on Elections, which also led the February 7, 2019 interfaith rally and January 13, 2019 walk for unity, to promote orderly and peaceful elections. Participated in by various multi-sectoral groups, the Philippine National Police hopes the political candidates and their supporters will uphold the integrity of the election process and to respect all laws, rules and regulations. The police stationed in the 21 towns and two cities of Ilocos Norte are intensifying police visibility by putting up checkpoints and also reaching out to netizens to promote their day-to-day programs and activities, which include “no to vote-buying” campaign. “Be an intelligent voter. Don’t be fooled by fake promises,” according to one of the latest Facebook posts of the Ilocos Norte police which has been liked and shared by netizens. Ditoy Laoag ti nakaipasngayanmi. Ditoy metten ti inkam dimmakelan, wen apo, dimmakkelkam met bassit. Numan pay adda dagiti gundaway a pinanawanmi ti Laoag gapu iti adal ken trabaho, inyaddang latta dagiti sakami ti agsubli ditoy “sunshine city”. Isu nga intay man padasen nga iladawan dagiti dadduma a nagbalbaliwan ti bukodtayo a ciudad. Irapintay metten a lagipen dagiti sigud a pagbutbutngan a lugar ditoy Laoag a nagtaudan dagiti naduma-duma nga istorya maipanggep kadagiti di-katawtaw-an. 1. Idi, mabain dagiti tao nga agibelleng iti kalsada uray wrapper laeng ti kendi. Ita, adun dagitay awanan disiplina a mangibakal lattan iti kalsada kadagiti basurada. 2. Idi, dagiti pedestrian lane ket nawada a pagnaan dagiti pada a magmagna. Ita, dagiti pedestrian lane ket nagbalinen a garahe dagiti trak ken pilaan dagiti traysikelan. 3. Idi, no agbatangtang ti kampana para iti orasyon iti malem, agsardeng dagiti lugan. Ita, uray saan nga orasyon, agsarde-sardengen dagiti lugan gapu iti nakulkol a taray ti trapiko. 4. Idi, mabuteng dagiti traysikelan nga agsalungasing iti linteg ta baka tulpaken ida dagiti adda iti turay. Ita, dagitin agtuturay ti mabuteng kadagiti traysikelan, nangnangruna no umadani ti panagpipili. 5. Idi, no adda bisyo dagiti agtutubo, ilemmengda. Ita, nagadun nga agtutubo ti mangipangas pay ti kinamammartek ken panagpayubyubda iti publiko. Malaksid kadagiti kamposanto, dagitoy man dagiti kabutbutengmi a lugar idi ukenkam pay lang. Sumagmamano kadagitoy ti awan itan. 1. Ines Building—Dakkel a pasdek a naaramid iti radrilyo. Dati a nakatakder iti igid ti McKinley St. Ibagbagada idi nga adda aggigian a kapre iti paraanganna. Aggammat kano ti ubbing. 2. Home Economics Building ti Northwestern College—Pasdek iti Lagasca St., asideg iti dati a Fire and Ash. Dua ti ibagbagada nga agparparang ditoy idi: white lady ken ikamen nga agalun-on ti tao. 3. Padsan River iti tengnga’t aldaw wenno rumabii—Iti tengga't aldaw ken sumipnget, mabalin nga agparang kano kenka ti sirena iti karayan. Pagilasinan nga addan ti sirena ket no nalangsi ti aglawlaw a buyugan ti naisangsangayan a kanta ti maysa a babai. 4. La Tabacalera iti laud ti Kapitolyo—Uray ita ket nakabutbuteng pay laeng ti langana. Ngem idi ubbingkami, ibagbagada nga adda dagiti agsikawsikaw nga ar-aria dagiti soldado a hapon iti rabii. 5. Grotto iti amianan ti St. William Cathedral—Kunada nga adda agparparang a black lady ditoy, nangnagruna iti sumipnget. Ti ammom kano ket nakamangisit laeng a baket a nagitugkel kandela. Ngem no talyawennaka, makitam a lussok dagiti matana. BARD NOTES: Happy bard-reading to Badoc ABC President Virgilio Calajate, Ilocos Norte Provincial Treasurer Josephine P. Calajate, INEC President Enrico Ruiz, INEC Director Joseph Vergel P. Calajate, Provincial Agrarian Reform Program Officer II Vic M. Ines, DAR Chief Administrative Officer Rudy Acacio, Ms. Genedine Domingo Jambaro and PNB Pasuquin Branch Manager Metty V. Guerrero. Greetings also to the employees of JVC Consortium, AMA Laoag, Ilocos Norte Regional School of Fisheries, Laoag City PNP, DAR Ilocos Norte, DepEd Laoag, DepEd Ilocos Norte and PNB Pasuquin. Laoag City—This city’s vice mayor and Sangguniang Panlungsod presiding officer Atty. Franklin Dante A. Respicio disclosed that the budget of the 80 barangays here will not be affected by the disapproved 2019 annual budget. “Ta adda daytoy review power iti Sangguniang Panlungsod a no after 30 days ket awan aksyon iti Sangguniang Panlungsod kadagiti barangay budgets, saan kayo a madanagan ta these will be deemed approved arig na a kasla met laeng inaprobaran iti konseho iti siyudad iti Laoag,” Mr. Respicio explained. 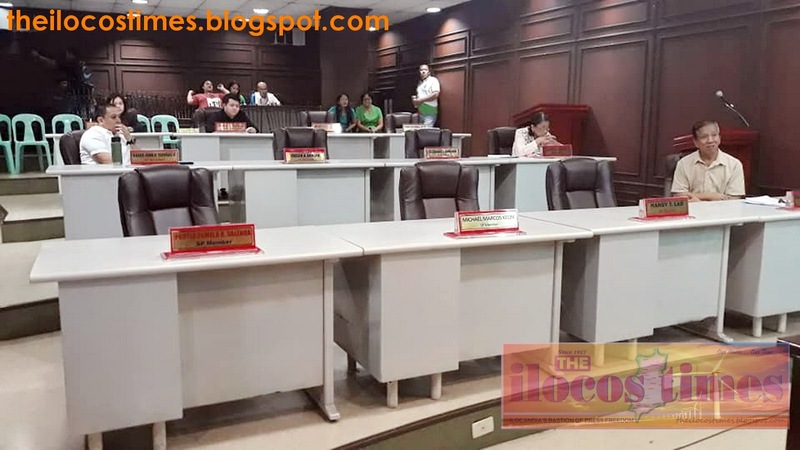 The vice mayor said this in response to Laoag councilor Shirley O. Sin’s opinion that they cannot tackle the barangay budgets until they approve or finally disapprove the city’s 2019 budget. Mr. Respicio added that barangay budgets are deemed approved after 30 days from date of submission to the council if the councilors do not act on it. “I will see to it that after 30 days, the presiding officer of the Sangguniang Panlungsod will be sending the necessary communications to the various barangays to convey deemed approved dagitay budgets yo,” Mr. Respicio stressed. She also noted that her opinion on the barangays’ budget is based on a Dept. of Interior and Local Government opinion that they cannot tackle any other issue at the council for 90 days until the city’s annual budget is either approved or disapproved with finality. 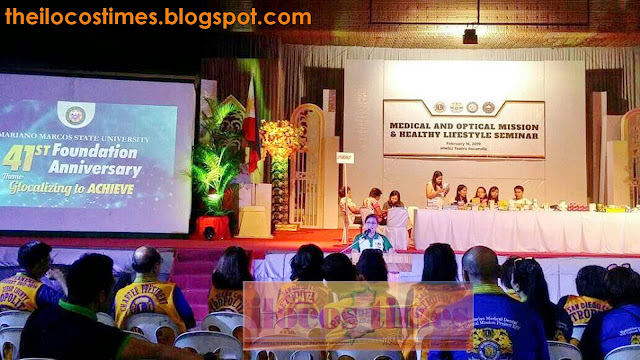 Batac City—The Mariano Marcos State University (MMSU) thru the help of the Lions Club of San Diego, California and the City Government of Batac held a medical and optical mission at the Teatro Ilocandia on February 16, 2019. MMSU President Dr. Shirley C. Agrupis welcomed the 14 members of the Lions Club with the University’s Seven (7) Point Agenda with a theme ACHIEVE; A - Academic Excellence; C - Creative, Relevant and Innovative Research Programs; H - High Impact and Transformative Extension and Outreach Programs; I - Improved Revenue Generation and Resource Management; E - Expanded External Linkages and Partnerships; V - Vibrant and Engaging, Culturally-Focused University Campus; E - Effective and Efficient Management. She envisaged in her speech that after achieving those pointers, MMSU will be the premiere Philippine university by the year 2028. Mrs. Agrupis also assures the crowd, especially the patients. of the support from the university down to the grassroots in Batac City. “Kadkaduaenda kayo ken madimi kayat a maudi kayo iti serbisyo ditoy Batac,” Mrs. Agrupis noted. Gracing the occasion were Dr. Leo Sicat, president of the Metropolitan Lions Club-San Diego County; Batac Mayor Albert D. Chua; MMSU Alumni President Bismark Angelo A. Quidang; Dr. Quintin S. Cocson, Jr. of MMSU’s College of Medicine; and Dr. Ricardo S. Guanzon, MMSU College of Medicine dean. There were more than 500 patients who came for the free medical services and eyeglasses from the said event. LAOAG CITY—Fish cage operators in the four provinces of Region 1 has been warned of a possible fish kill due to the effects of El Niño which is likely to occur with the onset of summer. Lilibeth L. Signey, regional director of the Bureau of Fisheries and Aquatic Resources in Region 1 said that as part of the El Niño mitigation plan for the fisheries sector, it is better for fish cage operators to partially harvest their stock to avoid fish kill. Ms. Signey explained El Niño may have a negative impact on aquaculture since high temperatures hasten the decay of organic matter and promote plankton bloom that could result in a fish kill. “We advised our fish cage operators to harvest those marketable size already to prevent further losses and to command a better price,” said Ms. Signey. The Philippine Atmospheric, Geophysical, and Astronomical Services Administration (Pagasa) announced weak El Niño conditions are already present in the tropical Pacific. "Climate monitoring and analyses indicate that the unusually warm sea surface which started since November 2018 is expected to become a full-blown El Niño,” the state weather bureau said in an advisory. Earlier, representatives from the BFAR Regional Field Office based in San Fernando City, La Union led by Ms. Signey conducted a quarterly fishery industry forum at the Hotel Asuncion in this city to present various lending programs which fisherfolk may want to take advantage of to improve their livelihood. Manila, February 18, 2019—Lieutenant General Lewis A. Craparotta, commander of U.S. Marine Forces Pacific’s (MARFORPAC), visit to the Philippines from February 16-18, 2019 emphasized the importance of the U.S.-Philippine alliance to the Indo-Pacific region. 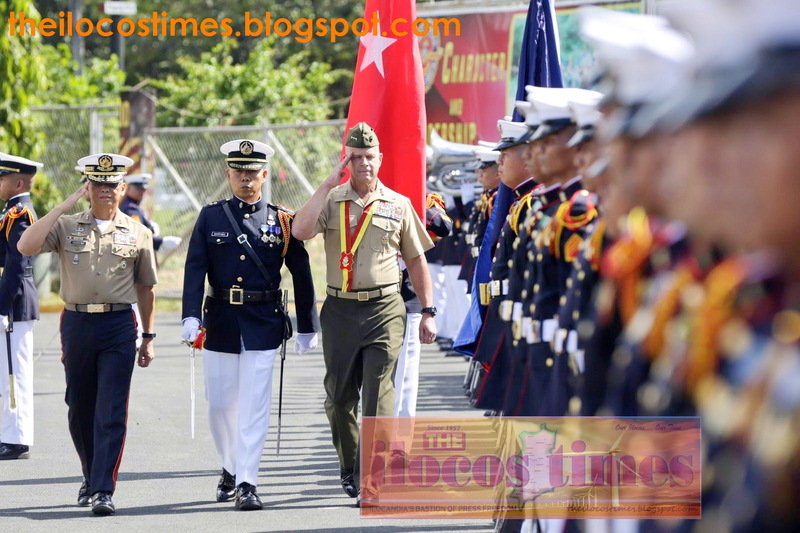 During his visit, Mr. Craparotta met with Armed Forces of the Philippines (AFP) Chief of Staff Gen. Benjamin Madrigal Jr. and the Commandant of the Philippine Marine Corps (PMC) General Alvin Parreño to discuss the US Marine Corps-AFP partnership. Mr. Craparotta joined Mr. Parreño to deliver opening remarks at the US Marine Forces Pacific Marine-to-Marine Staff Talks, a bilateral exchange in which members of the US and Philippine Marine Corps discuss opportunities to increase collaboration in the future. Mr. Craparotta discussed specific lines of effort outlined by former AFP Chief of Staff Gen. Carlito Galvez Jr. and U.S. Indo-Pacific Command commander Admiral Philip S. Davidson, which will frame the U.S. and Philippine Marine Corps’ exercises and activities in the future. LAOAG CITY—Residents here may have been doing something great to avert dengue, so far. For the period of January up to this day, the Provincial Health Office recorded no deaths due to dengue. Dr. Josephine Ruedas, officer-in-charge of the Provincial Health Office said the province continues to intensify its campaign to prevent dengue. Compared to previous years, she reported there were only few this year so far. Based on records of the Department of Health’s Regional Epidemiology and Surveillance Unit and Health Emergency Management Systems (DOH-RESU-HEMS), a total of 26,042 dengue cases were monitored from January 1 to March 31 in 2018. The regions with the highest number of cases include: Calabarzon (Region 4-A) with 4,902; National Capital Region (4,874); Central Luzon (4,482); Northern Mindanao (1,533); Central Visayas (1,487); and Western Visayas (1,482). In Ilocos Norte, it may be recalled that deaths due to dengue last year was at 24. In view of this, Ms. Ruedas expressed gratitude to all Ilocos residents for their continued support to the clean and green program of the provincial, municipal and village levels and ensure that no life is threatened by the dengue-carrying mosquitoes.